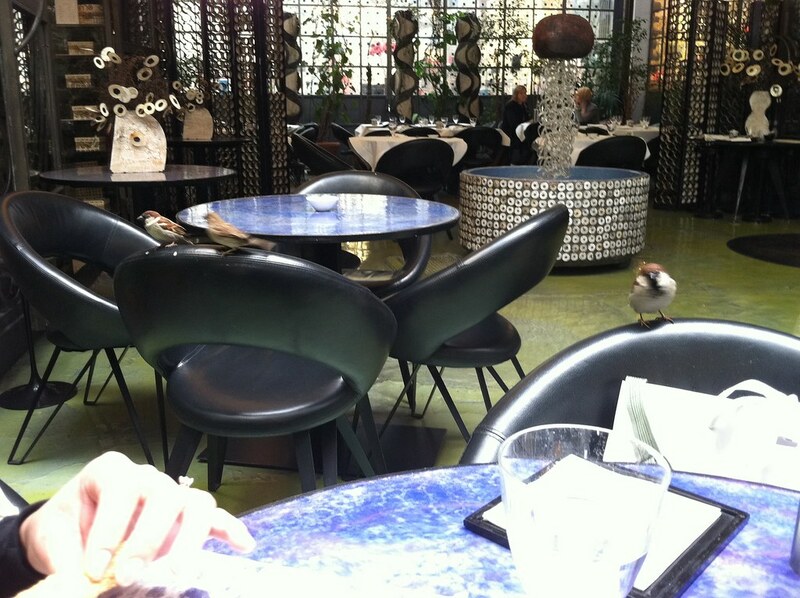 Eating city by city…London and Milan. – ugly food tastes better. Obviously the best pizza in the world can be found in Italy, and I love their combinations. 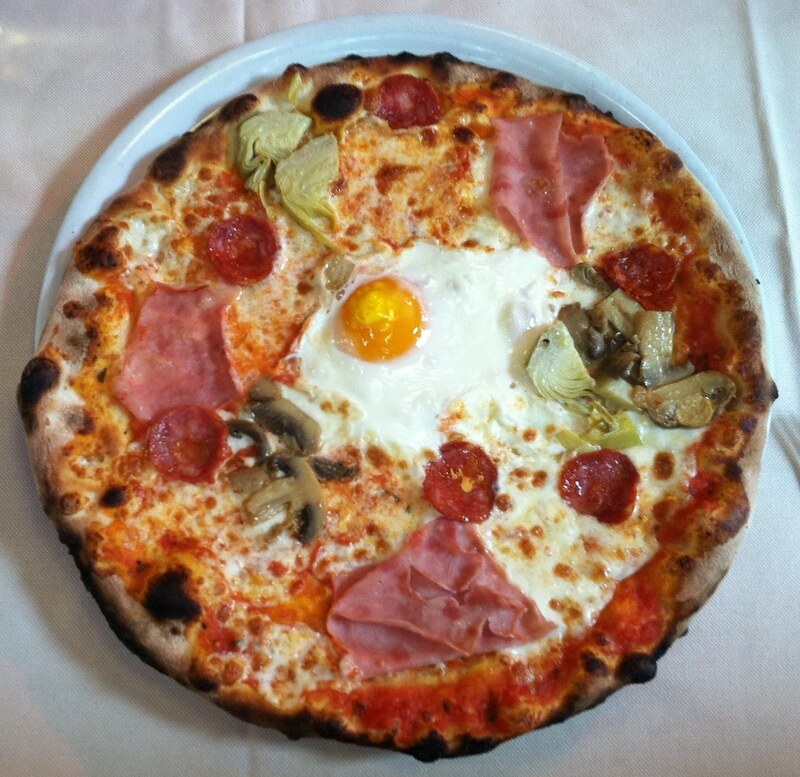 Artichokes, mushrooms, sausage, ham, and a fried egg!? YES PLEASE! With minimal, homemade cheese, a delightfully fresh tomato sauce, and perfectly cooked, crispy and chewy in all the right places crust. Mmmmm. It was the most divine way I could think of to test out my mold allergy. I was not surprised to find that fresh made mozzerella has made the cut! 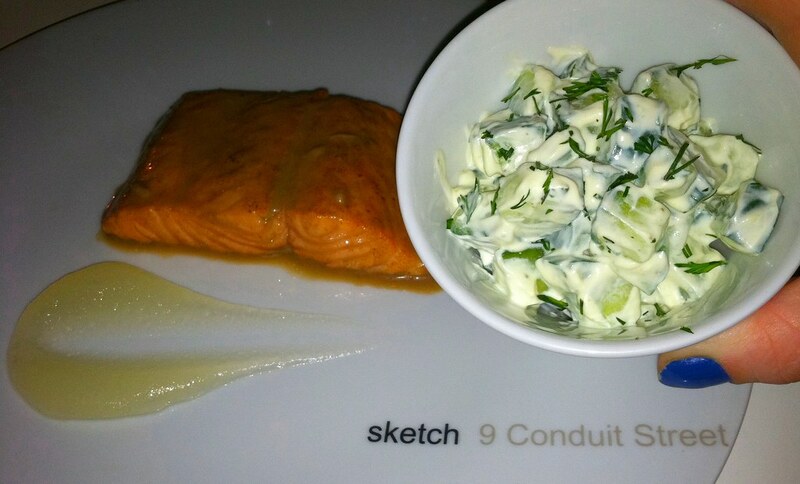 Now, London is not known for its wonderful food, however, if you have a chance, and the cash, Sketch is a great place to go. I love it. 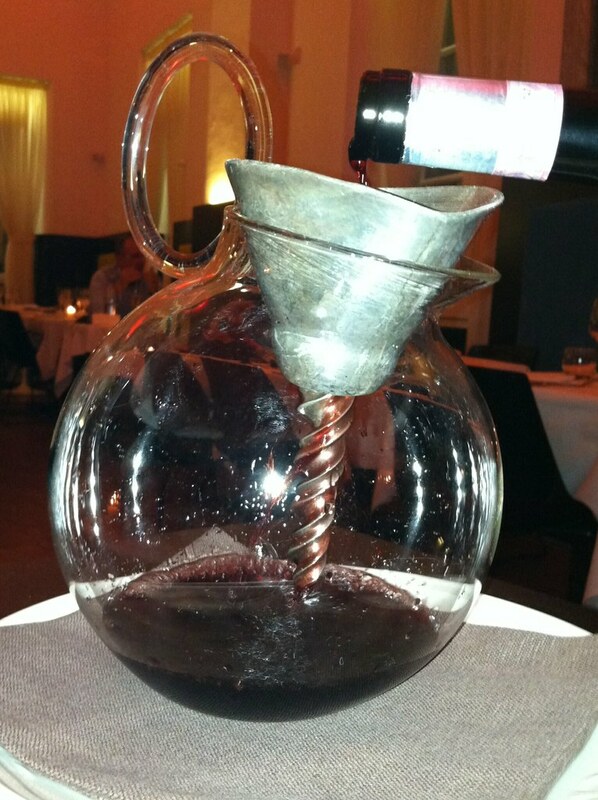 It combines a ridiculously beautiful, constantly changing atmosphere with a divine menu and impeccable service. Currently featuring designs by Martin Creed, it is colorful, with not one matching chair, glass or plate. 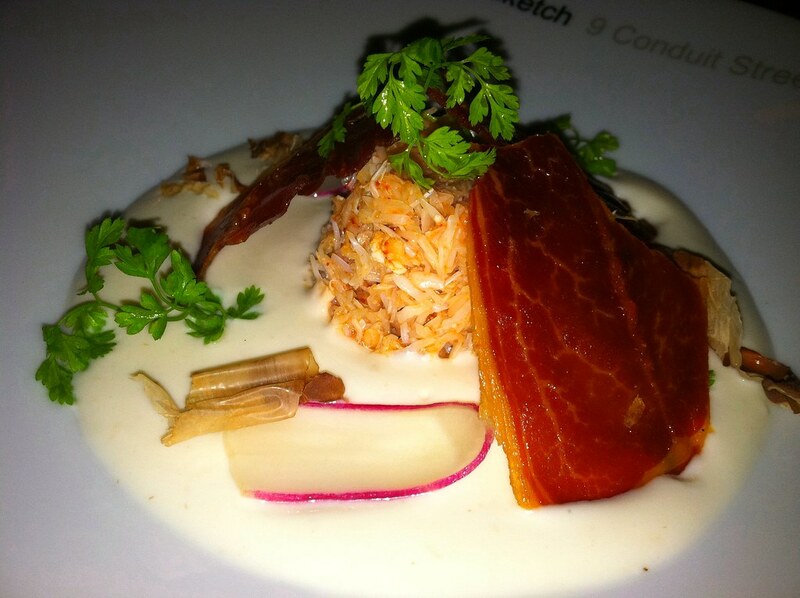 I dined with a coworker and I was good and started my meal with a cheeseless app…Crab meat and cauliflower velouté with bonito and Serrano ham. Forgive my crappy photos, the lighting was not great for iPhone picture taking, haha. It was divine. Crab is one of my favorite things on this planet!Then for my entree I had Guinness poached salmon with dill cucumber salad and a lemon gelée. 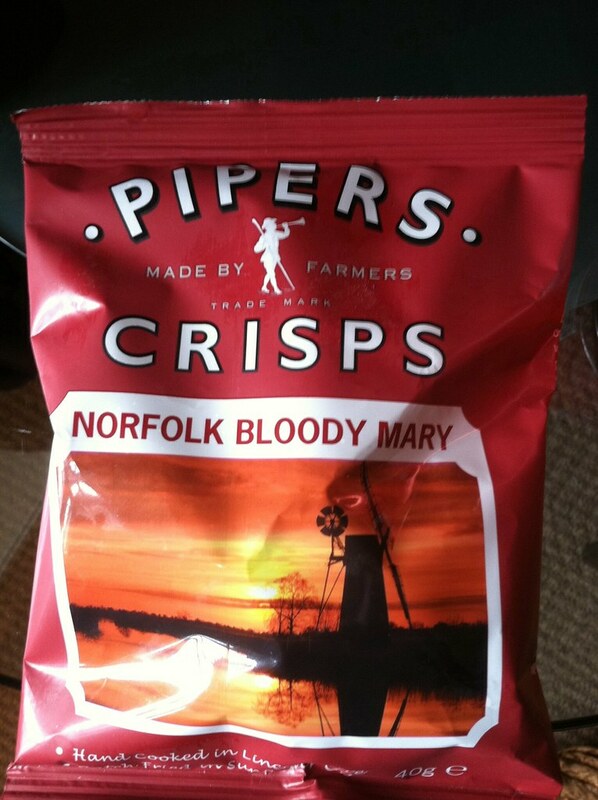 Appropriate for St Patty’s Day weekend and scrumptious! Now, I usually don’t order dessert, unless its something light and fruity, or ice cream. Its just not my thing. However, the dessert I ordered at Sketch was my FAVORITE part of the meal, and I don’t think i have ever said that before! When I was a kid, we got ice cream about once a month and it was a special treat for us. I always got either mint choc chip, or my favorite, bubble gum. No one else shared my love for bubble gum ice cream. It made my mother’s stomach churn (Gum was, and still is, banned in her household.) But I loved it. So when I saw Malabar on the dessert menu, I had to have it! 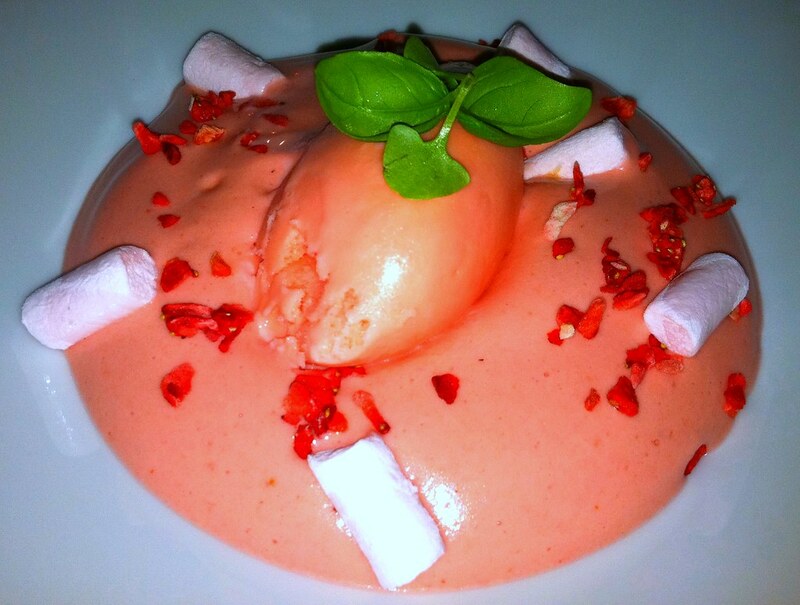 Malabar is a popular French bubble gum, and the dessert consisted of Bourbon vanilla-infused milk, strawberry mousse, bubble gum ice cream, strawberry marshmallows, and freeze dried strawberry bits. SCORE. Absolute and complete PINK HEAVEN, I tell you! A super delightful meal that was not surpassed at any point in the week, mostly because we didn’t have time for many leisurely dinner meetings on this particular trip. Plus you can’t beat the bathrooms there. On either side of a small, bubble shaped bar, 2 curved staircases rise to a completely open room full of pods. The left half glow blue, the right half, pink. Its spectacular. Nothing else I had in London was in any way memorable, so on to Milan! You saw the glorious pizza my coworker and I shared when we landed above, and then we went on to have an even unhealthier dinner, haha. 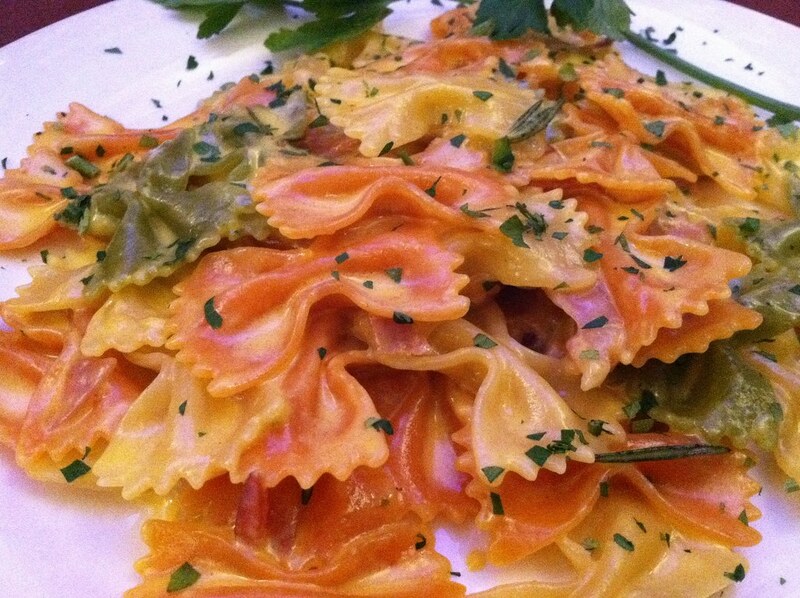 We shared a salad and I had farfalle in a traditional Milanese saffron sauce. DIVINE. Then we decided it would be best to follow up our meal with a cheese tray for dessert, because, what better way to test my allergy!? 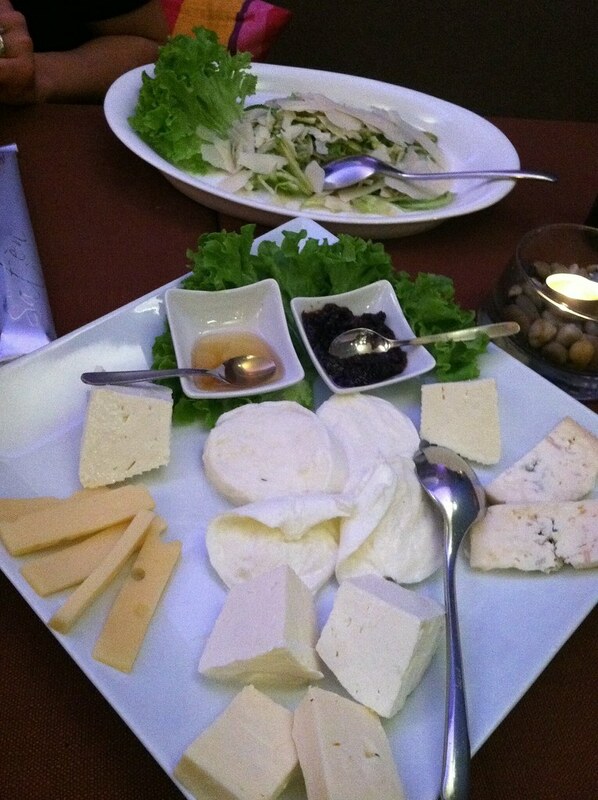 Fresh made burrata, mozzerella, delicious swiss and taleggio all made the cut! SCORE. The bleu cheese did not. But that’s kind of obvious. It was served with a fabulous onion jam and honey, which were perfection with these super fresh, milky cheeses. The next day was a crap ton of walking around, and we settled in for a quick lunch at my favorite place to shop in Milan. 10 Corso Como. I shouldn’t even actually say shop, because I could never dream of purchasing anything there, even for work. But seeing all the couture and visiting the art gallery and book store and then settling in to their beautiful atrium style cafe gives me inspiration for months. Priceless. This is probably one of my favorite lunches to have. I used to have it a lot at home. I call it Picnic Lunch…and sometimes Dinner,haha. 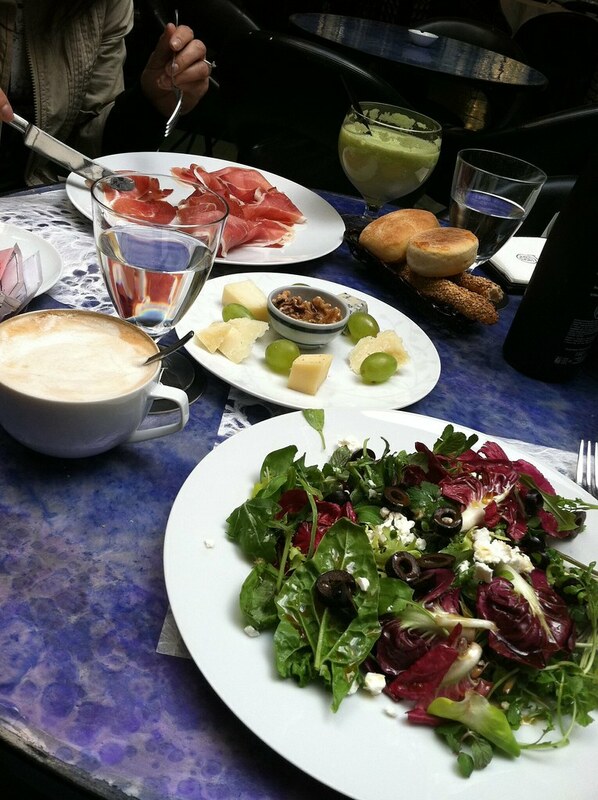 All i need is some good quality meat, cheese and salad to make me happy and satiated. oh, and great coffee. 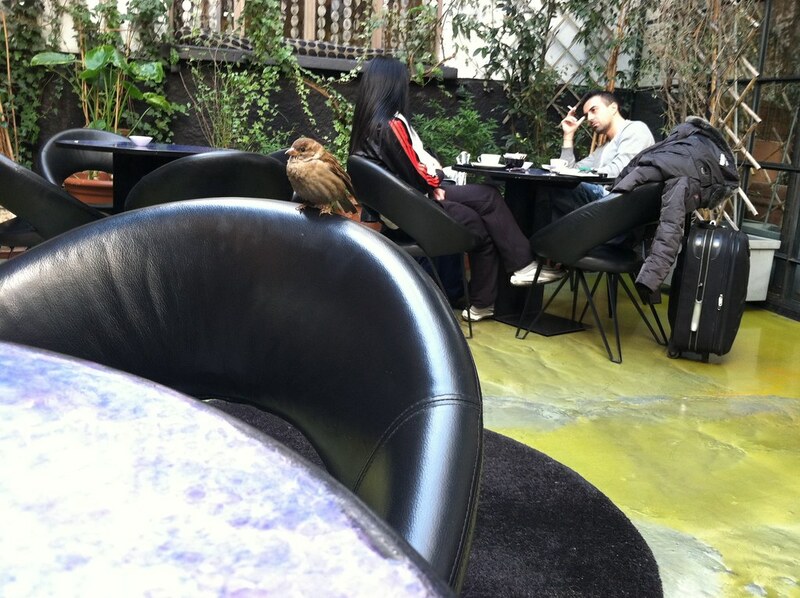 The only downside to eating in a garden atrium is all the little birds that want your food! 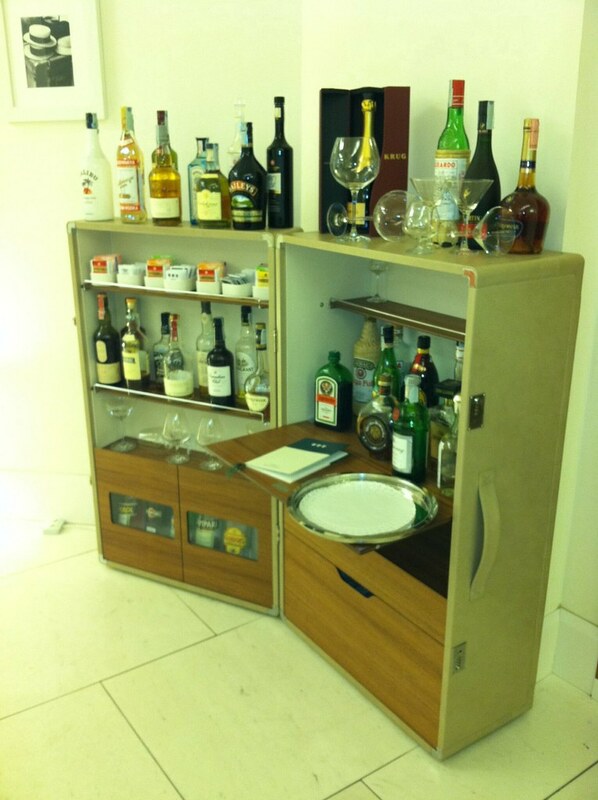 The only other things worth mentioning were a gorgeous wine decanter, and the suitcase bar at our hotel. Wow! Well, it certainly looks like you managed to take full advantage of the little free time that you had! And I am so happy to hear that you were able to reintroduce cheese into your diet! I would have missed it so much, and I can only imagine you did too.